People are more important than beliefs. * Some may consider this a corollary to the first Unitarian Universalist principle, “The inherent worth and dignity of every person”, or the third, “Acceptance of one another and encouragement to spiritual growth in our congregations [and beyond].” We are Unitarian Universalists because we choose to be in community with one another. So, let me rephrase that slightly: relationships are more important than beliefs. I've published a few essays recently about my perception of the place of humanism in the Unitarian Universalist Association. Many of the comment threads on those essays and on Facebook have been enlightening, and engaging with my fellow UUs in all of them has been a privilege. The essays also prompted at least one response in another blog. I realize now that I made some unexplained assumptions in those essays and that others have made assumptions about me and about humanists in general so that we are sometimes talking past one another. The summary of this recent engagement and reflection on it leads to the thesis of this post: Unitarian Universalism is moving beyond the humanist/theist debates and is transitioning to a discussion about naturalism. One of the assumptions I have been making that may be wrong is that we are using the same definitions of humanist, theist, atheist, agnostic, and naturalist. Before I get into this, I do have to apologize to those who are uncomfortable with labels. I agree that labeling is often a barrier to understanding because it sets up false circles around people that include or exclude, but I maintain that it is OK to self-identify based on your worldview while keeping in mind that we are all UUs and that relationships are more important than belief. As we tell our coming of age young people, it is fine work to clarify your worldview and to be able to express it clearly, as in a credo. In this essay, I’m going to define a humanist as a naturalist who has a particular interest in ethics and human and societal flourishing. Yes, being a naturalist means our worldview is without gods, which is the definition of atheism (“without theism”, not “against theism”) so I am going to use the word atheist even though many UU humanists do not self-identify as atheists. Just to make everyone potentially equally annoyed, I’m going to contrast naturalist with supernaturalist, and use the latter to refer to someone who believes in any entities, forces, or experiences that are outside of nature. Then I’m going to substitute the word theist even though I know there are many examples of supernatural beliefs (like animism, karma, and panentheism) that don’t require or imply belief in a personal God or gods. I’m going to try to avoid using secular/religious entirely though I observe that the wider culture commonly uses them as replacements for both atheist/theist and naturalist/supernaturalist. It’s my observation that most UUs fall on the agnostic side (we fall to the left, what a surprise!) There are certainly gnostics in our community, both atheists and theists, but being open minded is the norm and the expectation. I also need to point out the obvious that a person’s point is not fixed over time. Some trace a path that covers a large distance on this graph and others just oscillate around a point. One person’s location may move slowly (or never move at all) and another’s might shift quickly, which is often traumatic and disorienting. There is also not necessarily any right or wrong direction on this graph unless you consider “towards my position” as right and any other direction as wrong. (Many people disagree strongly with me on this point, I know, and I enjoy listening to their reasoning. For me, the only part of the graph I have a problem with is the extreme right edge, particularly the top.) Finally, it’s useful to note that some people’s point is fuzzy because they don’t care enough about the question to decide where they stand; they are “apatheists” a portmanteau of “apathy” and “theist”, or just haven’t settled on a position. Others reject the whole model, Sherwin Wine called them “ignostics”, saying the question is not meaningful because “every theological position assumes too much about the concept of God”. The difference between this graph and the ones in the references above is that they show binaries: you are either an atheist or a theist, you are either gnostic or agnostic. It’s an important part of my point that people are not binary; there is no black and white, there are scales of belief and confidence in knowledge. This means the star representing my position is in the agnostic side of atheism, but not too far from the (weak) gnostic side. I am fairly far from calling myself a theist. Even though I understand the reasoning of people who go just over the line and remain naturalists, I do not find it helpful to my "spiritual growth" to go in that direction (toward using theistic language to describe my naturalism). In fact, I have a problem with the term "spiritual growth" for this reason -- those who do use religious language think of spiritual growth as upward on this graph. As I said before, this is because it is natural to think of the "right" direction to move on this scale as toward your position. I would point out that many atheists consider theirs a more "mature" position, so moving down on the graph would be "spiritual growth" for them, though, being allergic to even quasi-religious language, they probably would not phrase it that way. What I want to highlight on this graph is that the interesting point on the up-down axis isn’t the center, which divides self-identified atheists from self-identified theists. The interesting point to me is what I call the natural/supernatural point, which is up above the center (I've marked it with an orange dot). There are some UUs whose conception of divinity or “the sacred” is poorly described by the humanist (equated with atheist) / theist dichotomy. What puts them over the line is style – they find the language of theism more descriptive of or compatible with their position. (They prefer “night language”, to use Michael Dowd’s phrase.) If you ask them to describe what they mean by God or any other theistic concept, the response is naturalistic -- it is poetry that draws them above the line. They may describe themselves as pantheists. People on either extreme may try to use the “no true Scotsman” fallacy to push people off of their side, but this is a graph for self-identification. I’ll also note another important point further up the up-down axis: this is roughly the panentheist position (that I've maked with an orange triangle). If we could have a scatter plot of UUs on this graph, I contend that a great majority of us would fall fairly low and to the left. Obviously, there is no UU circle or other shape on this graph that you are either inside of or outside of – that would require a creed – however, there is a center of gravity. Like an individual’s point, that center of gravity can and does shift. This is all just a thought experiment because I know of no scale that could be applied to these axes. Ultra-orthodox religions would cluster in the top right and New Atheists would be close to the bottom right (but probably not as close to the right, strong gnostic edge, because of the part of the scientific method about being willing to revise your beliefs based on strong evidence). I think there is widespread agreement that most UUs fall below the point on the theism scale where our values come from humanistic concerns, rather from a perceived need to please a God or gods or to avoid punishment in an afterlife. It came across in the comment threads that some theists act as if humanism only encompasses science and reason, not just that it values science and reason. I think it is true that some humanists overvalue science and reason; we call this scientism, and I criticize that idea as well. Conversely, it has come up that some UUs think (or perceive others as thinking) that any expression of theism, even the ones in the humanistic range, are ignorant and are a rejection of critical thinking. It was pointed out that I (and the UU Humanist Association) don’t criticize those stances publicly as often as I (we) should and I agree. While I do think there is an actual, important difference between naturalism and supernaturalism, there is no difference in human nature of people on either side of that point on the belief scale and we are all clustered so closely together on bigger issues that have actual moral implication, it is a shame to waste energy on debating. Rather than debate, I’d prefer to have a discussion with you about what experiences you have had or things that you value that make you believe in the supernatural. Or just hang out with you and drink coffee. So, why do I write articles expressing disappointment about implied slights to UU humanism? I will write more about that later, but the simple answer is because otherwise you are going to lose me and people like me. You are also going to fail to attract a large segment of the population that has rejected traditional, organized religion but that is looking for community. The UU Humanist Association has a new program, the Freethinker Friendly congregations program, that I think will be helpful in making space for humanists in congregations in a way that enriches all. We all agree that this is not a zero sum game. It does require engagement and discussion, but I think we can all agree that we are past the need for an atheist / theist debate. So I hope that the discussion so far has illustrated what I think is the common understanding among UUs that the humanist / theist distinction is a false dichotomy. I also hope it has helped situate UUs as clustered close together on the scale of atheism / theism in the wider culture and made the point that you can be a naturalist as both a humanist and a theist, and, more importantly, that you can adopt a humanistic ethic even while accepting some supernaturalist beliefs. And, though I didn’t make any arguments in its defense because I think it is obvious, let me restate my opening premise: relationships are more important than beliefs. * This is a nod to the Oasis Network, a new model of humanist community. “People Are More Important than Beliefs” is their first value. Pansy image credit: "Pansy aka" by André Karwath aka Aka - Own work. Licensed under CC BY-SA 2.5 via Wikimedia Commons. 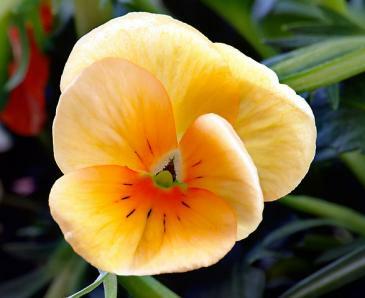 Why a pansy? Because they are the symbol of freethought and because it is pretty.